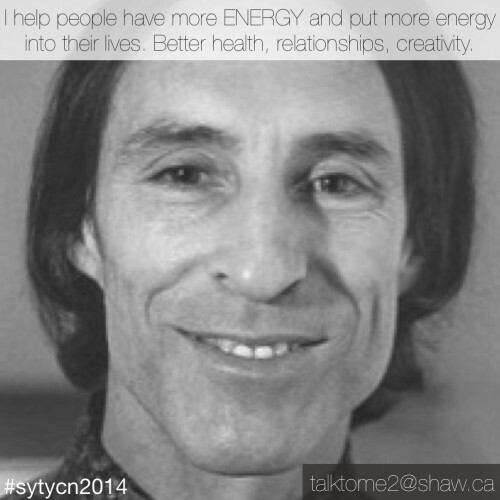 I help people have more ENERGY and put more energy into their lives. Better health, relationships, creativity. The result you’re offering is clearly “more energy.” And you’re suggesting that the impact of that is better health, relationships and creativity. Which I’d agree with! And the implication here seems to be “better energy could help you with everything and so I really help you with everything.” Which feels very broad. I think this is a case of niching around the diagnosis rather than the symptom. Meaning, if you helped with migraines then writing an ad saying, “are you dehydrated?” (which you might diagnose as the cause of most migraines) wouldn’t be as powerful and direct as “do you suffer from migraines?” I love your diagnosis — it’s just not the thing I’d lead with in your marketing. What’s not clear for me here is which symptoms you help people with. Where are people struggling most? One way to look at our niche is as the thing we want to be most known for in the marketplace. It’s the front door to the house. Now, certainly there are a lot of rooms to your house with many modalities and ways that energy can benefit them — but what’s the issue that’s most likely to get them to come through the door? The other issue here is this: are people craving this result you’re offering of ‘more energy’? Are they lying awake at night praying to God for more energy? Is this something they would gladly part with their money and invest their time into? My guess is no.I don’t think people would take much risk for such a nebulous result. A good question to consider is this: what’s the moment where you could show up that would help them the most? And what’s happening for them at that moment? If they’re lacking energy — where is that showing up? How is it showing up? What are they noticing? What do people say to them? Paint me a micro picture – capture one of those moments. Here’s to a world where everyone has the energy they need to do all of the good things they want to for the community! Thank you for doing this work. 5/10: vague and not sure of the photo. 6/10: “People” is just a bit too vague for my liking. I get that you’re trying to address people who lack energy. But are you talking to me? To my mom? My father? How do you help your clients achieve better health, relationships and creativity? Are you filling them up with herbs? Or are you helping them sleep better at night with fluffier pillows? Or are you giving them assignments for their creative activities? The “how” needs to be elaborated. I’d probably feel comfortable talking to you once I knew better what you were doing. But, with just this little tidbit, I don’t think I’d be able to open the closet door where the skeletons are. No niche here at all and such a wide array of offerings so it feels weak. Sounds like an add for a multilevel marketing scheme. Too broad, too vague. Room for improvement. 5/10: It’s everything for everyone . . . not niching. 6/10: More clarity on “who.” Who is your avatar? 6/10: Which people? And what area does it affect most? 9/10: As an introvert who’s ALL about energy management, this statement really resonates for me. 7/10: Have more energy and put more energy seems redundant. 5/10: What do you mean by “energy” — physical energy or motivation? I get the holism part of health, relationships, and creativity working together, but it doesn’t seem clear who you help and how you help them. 7.5/10: “People” is too broad for a niche so would like to know who you most want to work with and can best help. What type of energy do they have and where are they on the energy scale right now — none, some, lots but looking for the peak? Does more energy refer to the next step up or an exponential leap. Curious to know if ENERGY stands for something or is upper case for emphasis. 8/10: I like the idea, but am wondering if you work with the body or other techniques.